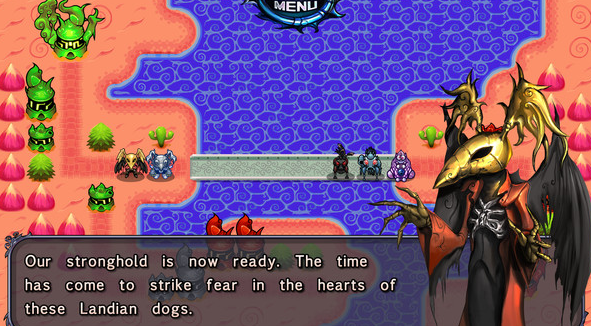 Desert Ashes is a turn based strategy game that takes place in an alien universe, on an alien world, on an alien land, and is about two rival alien races that are at war with each other due to a fallout that happened in the past. You take the role of the alien race called the Winged Crusade (sounds more like a team than an alien race), they don gold and red colors and look like birds. The Winged Crusade gets a bright new rookie and you are lucky as the leader of the Winged Crusade sees a lot of potential with the rookie and teaches the rookie the ways of becoming a great soldier. 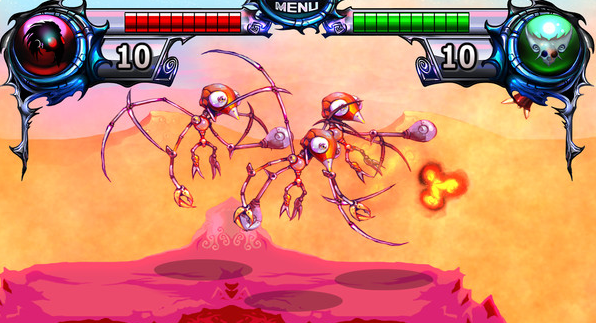 The Winged Crusade's goal is to wipe out the other alien race named Landians (now that sounds like an alien race). The Landian race have more of a squid look to them as they have pointy squid like heads, heck, some of them even have huge metal tentacles. The Landians won't go down to the Winged Crusade without putting up a fight and so it won't be an easy task for either side to win. How will this war unfold? (Click "Read More" to read the full review). The story in this game isn't bad at all as the story does go into why these two factions are fighting but the dialogue itself is very basic and could've been a bit stronger. The dialogue defiantly had some stronger moments towards the end though and they were great to see/read. The main campaign mode is made up of three episodes, they were quite short but that doesn't mean that their lengths weren't satisfying as the episodes were appropriately portioned to where they don't feel like that they go for too short or too long. This game did seem like it wanted to have more story that what it did as there were parts that left many questions open and also ended in a way to where it seems like there were more episodes planned for this game but didn't make it onto the full release (could there be a sequel in the future?). The core focus on the gameplay has two teams fighting on maps and the goal is to build up your army and capture all of the other players buildings. The way to win a match is that you'll need to capture the other teams main headquarters. Other than having an HQ, each team will also start off a few buildings to where you can build up troops, you'll also have other buildings that I like to call banks/mines as they help get you more money and the more the merrier. Your troops come in many different flavors as you will get troops that will battle on land, air, and sea. The strength on the troops depends on how much you are willing to spend on them as the more expensive they are, the more powerful they are. Just because they are powerful, that doesn't mean that they will get to the enemy base in time as each type of trooper will have their own unique movement pattern much like how each different type of chess piece does. You will also need some weaker grunts on the field as they are needed to capture buildings. The way you move your troops is via grid system to where the whole map has a grid over it (just think Chess or Advanced Wars (2001)". 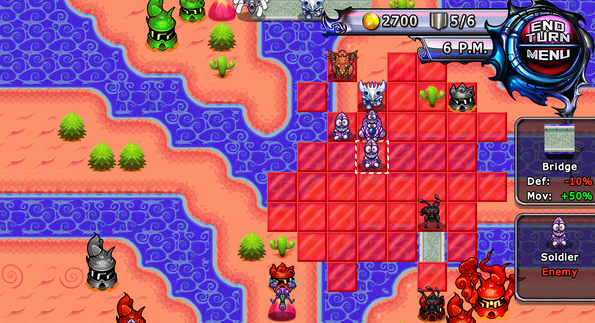 The game is also turn based and once you've done every thing you've needed to do, you just hit "End Turn" and then the enemy will do what they need to do, so on, so forth. Each character gets to move only once per turn but they can damage other characters multiple times during a turn, the reason why is that not only does a troop do damage from attacking but they can also counter-attack when the enemy troops are attacking. This won't happen all the time as a short ranged guy can't counter-attack a longed ranged guy when they are attack from out of your attack range. 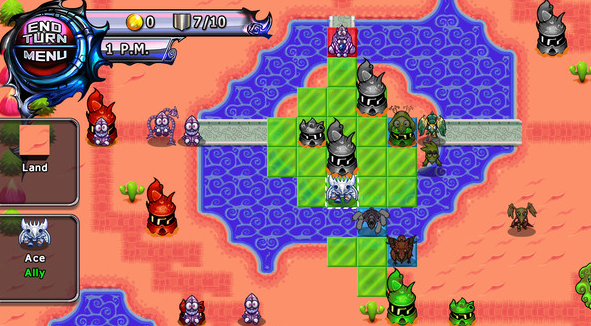 The battle system also has a rock, paper, scissors element to it as one type of troop is strong against another type of troop. The land troops are good against air troops, air troops are great against sea troops, and sea troops are great against land troops. It did take me a little bit to figure that out but that doesn't mean that you have to as knowing that little piece of knowledge will help you out a lot. The environment plays a huge part in the game as certain terrain will help give your troops more protection. Each turn also represents one hour in their time (not real time) and when it gets cold and dark during the very late hours of night, you'll notice that the environment also changes as all of the water found on the map will freeze over. 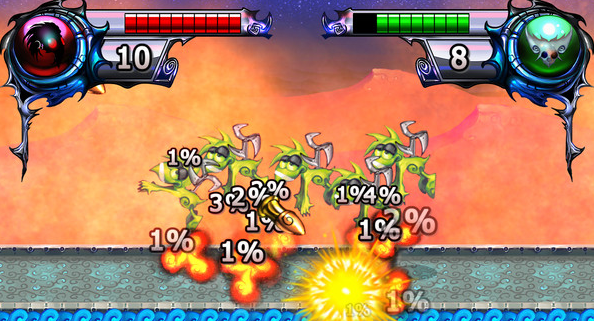 The water freezing over can change the battle dramatically as it changes the field dramatically. The water freezing over only lasts for a few hours/turns and it was a shame that this was the only kind of time based environmental change found in the game. I know what you are thinking, "this game sounds a lot like Advance Wars", I would be lying if I said that I didn't think that myself. This game does seem to take a lot of inspiration from that game and there's nothing wrong with paying tribute to a game. I also gotta give credit to the crew behind this as this is as close as we are going to get to getting an official PC version of Advance Wars until Nintendo starts making official PC ports to their games (do it Nintendo, I wanna see a PC port of Super Punch-Out with Steam Trading Cards and UPlay unlockables). This game sounds like it plays like Advance Wars, does it actually play like it though? The answer is yes but the gameplay in this game is quite unpolished. You'll be able to do most things just fine but there were some parts to the game that were very roughly done. One thing that could've been a bit tighter was the ability to select troops when they are on the battlefield, it can be hard to click on them sometimes due to the main interface being a bit slippery. Navigating through the main menu of the game looks like it was made for touchscreen devices and that is all fine on those systems but trying to navigate through them on the PC is very slippery and frustrating as you have to slide the menu bar by clicking and dragging with the mouse. This game did start off as really fun for me but the deeper I got into the game, the more repetitive it became. This game wasn't repetitive in a good way as I was getting bored doing the same old thing on every single level as the battles needed some more variety to them. The game is also pretty short at only around four to five hours long and you can beat this game if you have a whole afternoon to spare. This game does have both local and online multiplayer if you want to try something new and playing another human player is much more interesting than playing against the computer. A moderately sized problem I have with the game is that the in-game menu bar that rests in the top corner can get in the way of the game sometimes. This is a problem on larger maps that have buildings on the far top-left corner of the map and I can barely get my troops to take over the buildings in those areas as it wouldn't let me get to them due to the on-screen menu bar getting in the way. In the end I had to awkwardly move the map and hope I was quick enough to click the building before the camera goes back to a position where the on-screen menu bar get in the way again. Difficulty in this game is pretty easy as once you've got the "rock, paper, scissors" system down then you will not need to use much strategy to take over every enemy base. While very easy as I wouldn't become too cocky as this is also a game where the tables can turn if you get too full of yourself and let your guard down completely by thinking the enemy are complete pushovers. Getting cocky has happened to me before in this game and boy do I regret it as I lost in a very terrible way on one stage and that is the reason why you need to go into each battle with a very basic strategy. It isn't hard to come up with a basic strategy for each level as it is one that anyone and everyone can learn without much putting much thought into it. 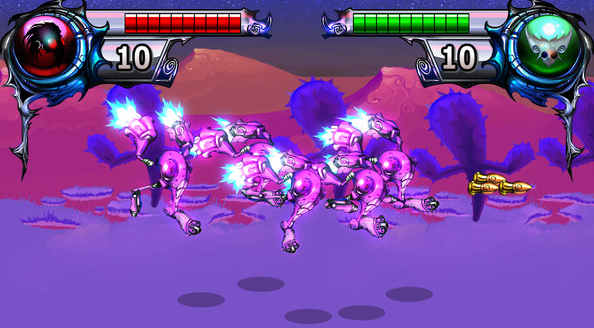 This game does include online multiplayer where you and a friend can play one of three modes. The first mode is called Conquer and in this mode you have to get your army to take over the HQ of the other player. The second is called Annihilation, this mode requires you to kill all of the other players troops. Third (and final) mode is called Assassination, this mode requires you to take out a certain troop from the other players team. The online mode is really fun due to the other players being unpredictable unlike the AI and plays how the main modes should've played in the first place. Online mode is also mostly lag-free, so you can play against players without any trouble despite having a very high ping count. The downside to online mode is that starting a game itself is frustrating, it can take several tries to get a game started as have an annoying error message pop-up but once you've got a game started, it's all good. Graphics in this game has a cool mixture of natural and artificial looking designs. The characters have a sweet mechanical look meets magical look and that will put a smile to your face. The look and designs of the maps were very basic but were also very decent as the maps had some fun looking maps that will make you want to play them. The animation is rough looking as it looked like it was made cheaply using flash and it ended up looking ugly. The soundtrack had a very nice orchestra sound to it and it went with the game very well. The soundtrack isn't perfect though as it is also very repetitive and while it may sound nice, you will get a bit sick of hearing the songs loop. There were also a few times where instead of the track replaying, it instead started to make a weird skipping noise just like that of a broken record and it did hurt my hears. Overall this game was not a bad idea but it did fall a little short in a few areas and was a bit too unpolished for my liking. I'm barely giving this game a "no" rating and that's a shame too as this game could've been classic. Could've been better.